To celebrate 50 years of innovation in the outdoors industry, Lowe Alpine have given us a Cholatse 65 and a Cholatse ND60 to give to 2 lucky winners in our 2017 Lowe Alpine Backpack Giveaway. Ever since the Lowe brothers, Jeff, Greg and Mike, founded Lowe Alpine in 1967, the company has been at the forefront of innovation and design, breaking boundaries and setting new standards in adventure gear and clothing. 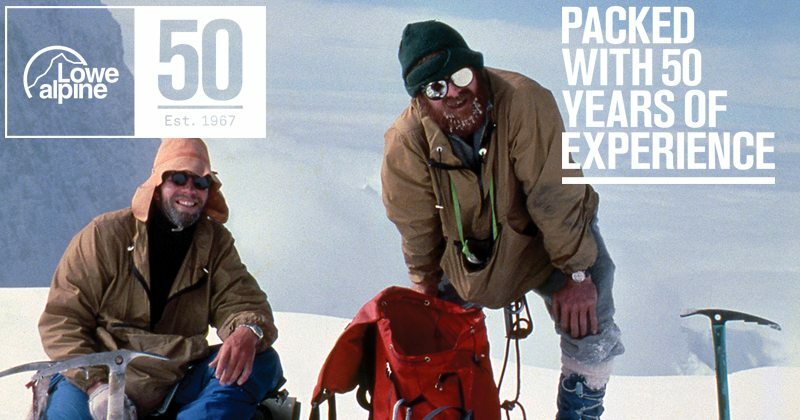 Whether it was the first internal frame backpack or the Tuber belay/rappel system, the Lowe brothers set the standard in thinking outside the box and coming up with practical equipment to further enhance the user’s outdoor experiences. 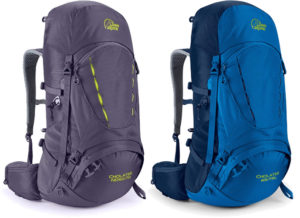 The Cholatse pack is a typical Lowe Alpine design with great build quality, clever features and easily adjustable harness and we have one men’s 65 litre and one women’s 60 litre to give away in our Backpack Giveaway. “The Cholatse range features an adjustable, ventilated back system, dual compartments and front and lower entry options. If and when the terrain becomes a bit more challenging or you’re lucky enough to be in warmer climates, then the air mesh ventilated back panel will keep your back cool even if your journey heats up. For your chance to win either one of these packs, check out our Backpack Giveaway below and answer a simple multiple chice question. The following are the terms and conditions of the Great Outdoors Lowe Alpine Backpack Giveaway 2017. Your participation in the competition shall be deemed to be your complete acceptance of the terms and conditions herein. •The winners will be announced via social media channels on Wednesday, July 12th. •Closing date for all applications is Midnight on Tuesday, July 11th 2017.